I don’t usually do a whole lot of self-promoting on this here site, but it just occurred to me the other day, that I haven’t really pimped my t-shirts in quite some time. What better time of year to get your loved ones (or yourself) some apparel proclaiming your love for beer? Let’s start off with my personal favorite  which I’m actually wearing at this very moment. There are carnivores (as evident by all the bacon blogs popping up all over the Net). There are omnivores, those consumers of everything. And then there are beerivores. 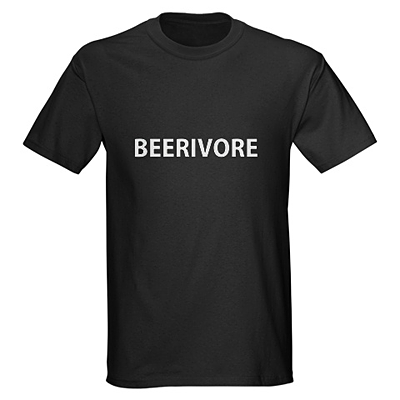 The beerivore consumes everything craft beer-related with an unbridled passion. Get yours here. My second favorite shirt is the Beerontologist. A beerontologist is one who is obviously a member of that whacky Church of Beerontology. No astronomical monetary dues. No space aliens (or unwanted probing). And no Tom Cruise. Just a simple declaration that you worship alcoholic beverages brewed with malt and flavored with hops. So go pick up a few for friends, family or yourself. Happy holidays. Share "Beer T-shirt Holiday Gifts"